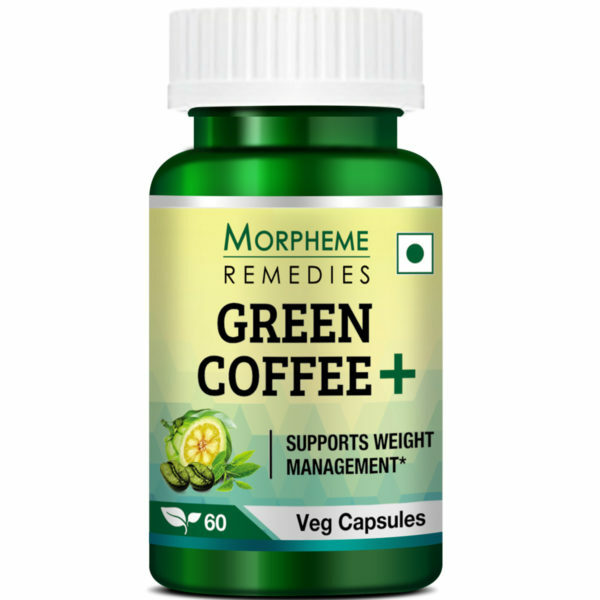 Morpheme Remedies Green Coffee+ is a rich combination of Garcinia Cambogia (a tropical fruit also known as Malabar tamarind), Green Tea, Green Coffee Beans and Ashwagandha. The natural ingredients in this product stimulate metabolic activities and support body weight management. It helps decrease the accumulation of fat in the body as well as could help suppress the appetite . It also helps in maintaining the body temperature which assists in burning extra fat. Morpheme Green Coffee+ is made from natural ingredients and do not contain any fillers, chemicals and harmful substances. Ashwagandha is popularly known as a wonder herb . 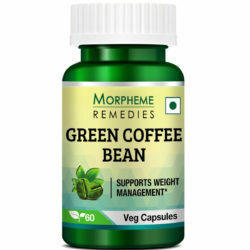 Is it safe to take Morpheme Green Coffee Beans Veg Capsules? Yes, it is 100% safe since it is made from natural ingredients and does not contain any fillers, chemicals and harmful synthetic substances. For best results you need to accompany supplements along with diet and exercise. Any of these alone cannot give best results. Directions: Take one capsule 1-2 times a day or as directed by your healthcare professional. This is an amazing product. It helped in putting a brake on my appetite and supports metabolism of fats. I am feeling healthier, energetic and losing fats. 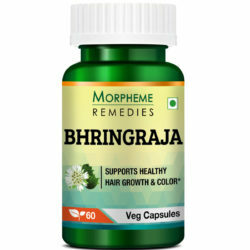 This product has helped in suppressing cravings, reducing fatigue and burning fats. This product has helped energize and increase metabolism. It is helping me exercise and burn fats faster. This is a good product for boosting metabolism. I found this helpful for weight management. This product works as described. It helped in burning fats, reducing hunger and fatigue. This supplement has been of immense help. It helped in bolstering my body’s sluggish metabolism. I am manage fats at a faster rate after taking this product. Finding the right product for weight management is not easy. However, after taking the Green Coffee Plus capsules I realized that this product actually works. It helped boost metabolism and is helping in breaking down fats. Didn’t gain any more weight after taking this supplement. This supplement has worked for me. I started manage fats at a faster speed after taking this product. This supplement is supporting faster weight loss. My health has improved after taking it and my energy level is higher. These capsules contain good quality extracts. They helped in easing weight loss, seemed to have worked as a metabolism booster. Green coffee plus has worked for me. It helped in accelerating fat burning. Lost more fats in two months after taking this supplement. Green Coffee plus is working as a weight management supplement. I’m losing weight more speedily after taking this product. It supports metabolism and curbs appetite. 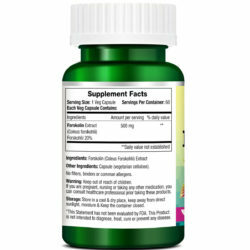 This dietary supplement has helped in easing weight loss. After taking it I am losing fats faster, probably it has helped in revving up metabolism. Green Coffee+ seems to help in managing the body processes that help in eliminating excess fats. After initial weight loss through dieting and workouts, when I couldn’t lose more weight, I started taking this supplement. It helped restart weight loss. The extra support I needed to lose weight has been provided by this supplement. It helped in suppressing appetite and promoted fat burning. It has been good for my metabolism and health. This supplement is supporting faster weight loss. It is a potent product. 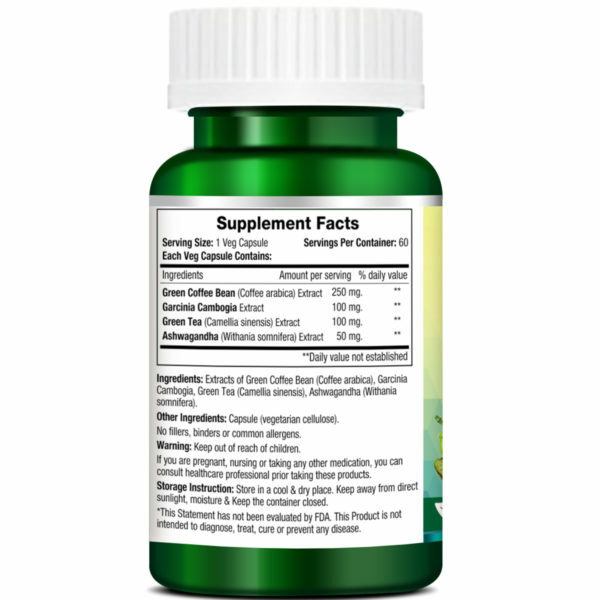 This supplement is a mixture of green coffee bean and other plant extracts. The quality of the product is good as evident from the result. It is supporting faster weight loss and curbed cravings. Green coffee plus capsules are helping in eliminating the fats from my body. After I included this supplement in my weight loss plan, I started losing more fats. At the initial stage of weight loss when I was finding it difficult to curb my cravings and suffering from lack of energy, this supplement helped me. It is a safe appetite suppressant and metabolism booster. The supplement is helping in getting rid of the excess fats fast. It has increased my energy level and helped suppress appetite. After my weight loss efforts reached a plateau, to restart weight loss I started taking this green coffee bean supplement. 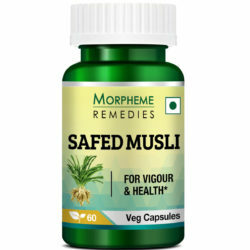 It helped in boosting my energy level and helped in faster weight loss. This is a good supplement. Safe and effective. It helped in boosting metabolism. This product has been an useful addition to my weight loss program. It helped in easing weight loss by suppressing hunger and improving metabolism. When I was trying to lose weight initially hunger, sluggish metabolism and fatigue were the main obstacles. Luckily, Green Coffee Plus helped in overcoming these problems. Now I am losing weight with diet, exercise and this wonderful product. Though green coffee bean extract is the vital component of this supplement, it contains other ingredients such as garcinia and ashwagandha. It is not only helping in breaking down my body fats, it is also helping in boosting my energy and improving my mood. This supplement is helping me in losing weight at a faster speed. It helped in easing dieting and improved my ability to do workouts without becoming exhausted fast. Green coffee plus is a good supplement for weight loss. It works as a metabolism booster, helping me in getting rid of the excess body fats. I’m losing weight a little faster by taking this supplement. It is helping in reducing my belly fats. The extra support I needed to lose weight fast has been provided by this supplement. It has helped in curbing hunger and seems to have helped in bolstering metabolism. 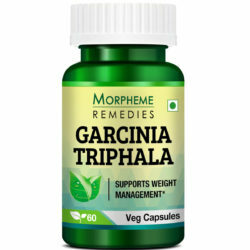 After some initial weight loss with diet and exercise when I could not lose further weight, I started taking this product. It has helped in boosting metabolism and reduced hunger and helped restart weight loss. Weight loss has become easier and faster by taking this supplement. It helped in curbing hunger. It’s a good fat burner. My energy level has increased. The extra help I needed to lose weight fast has been provided by this supplement. It helped reduce excessive hunger. It is supporting faster metabolism. I am impressed with this product. It is a safe appetite suppressant. It helped in reducing hunger. It gave me energy. I am losing weight. Weight loss became lot more easier for me after I started taking this product. It helped curb appetite and improved mood and energy level. I’m satisfied. Weight loss has become speedier after taking it. I feel energetic and less hungry. Losing weight is not easy especially at the initial stage. This is the reason I started taking this supplement. It helped boost metabolism and made me energetic. It even worked as a safe appetite suppressant. For an obese person accustomed to overeating losing weight is not easy. I used to feel weak and tired. However, things started to improve after I started taking this supplement. It helped in making me energetic, boosted metabolism and reduced hunger. I just finished the first bottle of Green Coffee Plus. In this one month, my energy level has gone up. It has helped in giving me relief from excess hunger. I lost some belly fat. I ordered the second bottle to keep the ball rolling. This is a safe and effective supplement for losing weight. 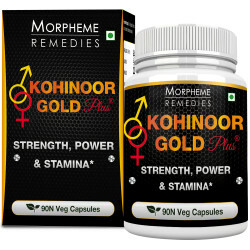 It helped in boosting metabolic rate. I feel energized. This supplement provides that extra help for kick starting fat burning. Its metabolism boosting effect is helping in breaking down the fats and is making me energetic. A good supplement. I am taking this for 3 months. It helps in keeping me energized. It is supporting faster fat loss. Getting rid of the fats that had accumulated in my body for years was not easy. Fortunately, I found this product. It helped speed up metabolism. It even acted as an appetite suppressant. Now with dieting and exercises I am losing weight. This supplement is working for me really well. It is suppressing appetite without causing any problem. It’s helping in knocking off the extra weight. In addition to green coffee bean, this product contains garcinia, green tea and ashwagandha. All these are known to help in weight loss and maintain healthy metabolism. The quality of this product is good. I feel energetic and am losing weight. Green Coffee Plus has helped in several ways. It helped in making me energetic that helps me in exercising longer. It helped in reducing overeating. I think this is a good metabolism booster. This product is giving me energy and helped curb frequent hunger pangs. I think this is good for boosting fat metabolism. This product has been useful for reducing excess body fat. I feel more energetic that seems to be the metabolism boosting effect of the product. My cravings for sweets and unhealthy food are now less. Green Coffee Plus has been effective in speeding up fat metabolism. It helped in making me energetic and curbed excess hunger. This green coffee supplement helped in speeding up fat burning. I lost more fats ever since I started taking this product. It helped in boosting my energy level and has been quite effective in suppressing appetite. 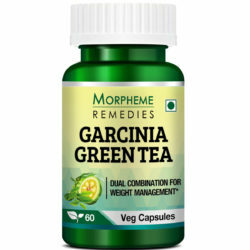 This product is helping in faster weight loss. It helped bolster metabolism that is helping in getting rid of the excess fats and increased energy for working out. Green coffee plus has proved to be a useful supplement for me. I’m taking it for 3 months. It helped in boosting metabolism and energized me for workouts. It even helped in suppressing appetite. Green coffee plus helped boost my energy. It helped in reducing cravings. Now I eat less and yet feel energetic for exercises. I am burning fats at a faster speed after taking green coffee plus. It helped boost my energy level that helped me in exercising. It helped curb excess hunger. A safe and effective product. I feel energetic and burning fats with the help of this supplement. It is helping me in exercising. I also feel less hungry. I’m taking Green Coffee Plus for two weeks. I feel my energy level has increased by taking it. I feel less hungry. My exercising capacity has increased and am feeling better. This product is supporting speedier weight loss. It is helping in breaking down the body fats. I feel more energetic and workout fatigue has lessened after taking it. Moreover, it helped reduce excess hunger. This product is assisting in faster weight loss. It is also helping in breaking down the belly fats. It helped curb my appetite and boosted energy. When taken before workout sessions it helps in keeping me energized. This product is assisting in eliminating the fats. This is indeed a useful product for weight loss. It helps suppress cravings, making me feel full fast. It works as a long lasting energy booster that helps me exercise. I feel less hungry after taking this supplement. My energy level has increased and it helped reduce fatigue during exercise. Overall it is a good product that helps the weight loss process. It’s been more than 3 months that I’m taking green coffee plus. It is a wonderful product for weight loss. It helped speed up weight loss. I started burning fats at a faster speed by taking this product. This helps reduce excess hunger. I feel energized. Helping in burning fats. This product is helping me in eating right by reducing cravings. I feel energized after taking it. This is helping in losing weight. This product is helping in getting rid of the excess fats. It appears to be an effective metabolism booster. It helped boost energy level. I feel less hungry. This product seems to help in suppressing appetite. Following instructions for best result. This helps increase the energy level. I feel less hungry. It is a useful weight loss supplement. Works good. Helps reduce cravings. Helping in losing the body fats. An excellent energizing, metabolizing product. I’m taking this for the last 3 months. It helped suppress excess hunger. I can exercise longer. After I started taking this product I feel less hungry. This helped me get rid of my unhealthy diet. Now I feel content after eating small nutritious meals. I also feel my energy level has increased. I take this product daily and also exercise. It is a good energy booster. I hardly feel the urge to overeat. It helped cut appetite and increased energy. I just started to use this supplement. It helps with cravings. Provides extra energy that helps in exercising. This assists in weight loss. Green coffee plus is helping in weight loss.This is an effective appetite supplement. It helped reduce overeating. My energy level has increased. 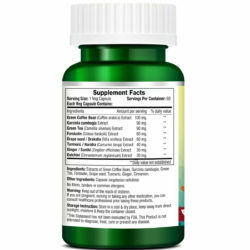 This green coffee bean supplement is quite effective in suppressing excess hunger. It appears to have helped in boosting energy level. Helping in weight loss. I’m taking this supplement and also exercising. I am noticing faster weight loss after I started taking this product. It helped suppress excess hunger. Feel more energized for workouts. Green coffee plus is a supplement that has helped me in overcoming excess hunger and low energy that were impediments to healthy weight loss. It helped me stop overeating. An effective supplement for weight loss. Works best for overweight people who are struggling to overcome hunger. After taking this product I do not feel the urge to overeat. It helped reduce appetite without any harmful side effect and helped boost energy. Taking this supplement for 2 weeks. It works best as natural appetite suppressant. Appears to boost metabolism. I found this supplement quite effective in reducing the excess fats. I lost some weight after taking this product for 2 months. It helped in curbing appetite. There was no side effect. This product has definitely given my weight loss efforts a boost. It reduced hunger. I eat less after taking it. Can exercise longer. This supplement was effective in reducing hunger. It energized me. It is a useful product for initiating the weight loss process. A good product for boosting metabolism. It started showing result in a few days. It helped in increasing energy and exercising capacity. Helped in curbing appetite. Taking this product for a few weeks. It appears to be working as appetite suppressant. I feel more energetic and this is helping me in exercising. Green coffee bean provides me energy. I do not feel tired all the time and can exercise longer. It helped reduce unhealthy cravings for snacks. Good supplement for weight loss. This product helped reduce excess hunger and increased energy level. Burning more fats despite following the same workout routine after taking it. This supplement is quite effective in suppressing excess hunger. It seems to help in increasing energy. Supporting weight loss. This is quite useful for boosting metabolism. I lost more fats after taking it while maintaining my exercise routine. It keeps me energized and made me less hungry. Taking this product for over a month. It is helping me in eating less. Energy level is higher. A useful product for losing weight when combined with diet and exercise. I must say that this is an effective supplement for controlling hunger. After I started taking this product I feel full faster. It is helping in keeping me energized for physical activities and supporting weight loss. This green coffee extract helped break weight loss plateau. Good metabolism booster. Helping in burning fats. Green coffee plus is a wonderful supplement for controlling appetite and boosting metabolism. It is helping in faster weight loss.